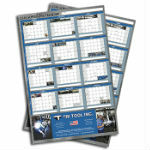 Get a free Tri Tool Inc. 2014 Scheduling calendar. Fill out the form to get a full-color 24″ x 36″ calendar. Name of organization is required.